Can anyone identify this uniform from WW1? Interests:Studying and researching British Army uniforms and insignia. Other rank with collar dogs and the subject crossed the border from the US to Canada. Could we be looking at a Candian here? No the OP makes clear (or at least implies strongly) that the man concerned was an American who crossed into Canada to enlist. Also, most of the early Canadian units wore their own, Canadian pattern of khaki SD until at least 1916, and I don't think I have ever seen a Canadian (yet) in the British SD 'simplified' pattern of jacket. What about Yorks and Lancs for photo 2 and 3? Badge shape and titles might match? Yes that would be a good fit for those photos Tim. I am not the best on uniforms but I think this lad of the 21st CEF has the simplified jacket. It just makes sense to me: if he was a US citizen who crossed the border to enlist, surely he'd join a Canadian unit? Not necessarily Steven, both Canadians and Americans hopped across the sea to Britain to enlist because the British Army was already engaged and they thought they would get into action more quickly. There were numerous cases of this. Yes I think so too John. The first I have seen, but I think the issue of some must have been inevitable. Major-General, he probably claimed to be Canadian when he enlisted. At least, that is what I have heard. I think you mean me....Frogsmile? The ranks against each name are just a bit of fun and each forum member is 'promoted' when they post regularly and contribute to the forum. Yes I did acknowledge your earlier post that he had claimed to be Canadian to enlist. 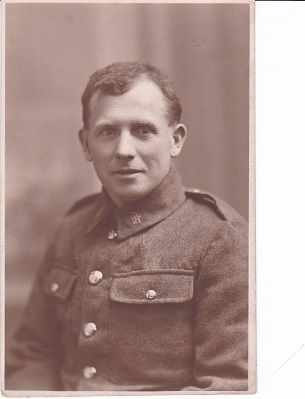 Steven thought that he might be in a Canadian regiment, but given the details you have provided and the appearance of his uniform both, during and after the war (1923), he looks to me to have been in a British regiment in the British Army. I have found a little more info on him.... according to his mother, he served in the First Canadian Cavalry and went to France for 4 years. Does this help, or even make any sense to anyone? Thx! I think you might’ve made a breakthrough. The Canadian Cavalry Brigade fought in both a dismounted and mounted role in France. In the first photo I now think that he is wearing maple leaf collar badges. This might fit with the Fort Garry Horse, who were a militia cavalry regiment (i.e. not regulars) recruited in the Western provinces of Canada that were/are presumably in easy reach of the U.S. border. However, in the second photo he wears a cap badge that seems shaped like the Lord Strathcona’s Horse, a permanent force (regulars) Canadian cavalry regiment, one of two in the Cavalry Brigade. The third regiment, the Royal Canadian Dragoon’s, were also permanent force, but can be ruled out as their very distinctive cap badge was nothing like that shown in your photo. N.B. Although Canadian units had their own style of khaki uniform at the beginning of the war, this could not be sustained in the field in France and Flanders and they were instead provisioned with clothing, etc. from the British supply system. This fits with your photographs. Perhaps he transferred into the British Army at the end of the war, although that seems odd as the first thing to happen after any peace declaration is to significantly reduce the size of the Army by discharging large numbers of soldiers. Interests:History, and the lessons that can be learned from it by those who do not prefer comforting delusions. From the first very small photo, I had the impression that the collar dogs were positioned so as to be at right angles to the center line of the "V" of the collar tab, rather than level with the ground, so to speak. A ten o'clock to four o'clock orientation, rather than six to twelve. If that is so, I suspect a crown at the ten o'clock position and possibly the draped ends of a motto scroll on either side of a central point at about the four o'clock position. The obvious question would be, what was he attempting to hide by having the badges, and buttons even, painted out? A good start would taking the photos out of their frames. By "his mother" I assume you meant his daughter? To conceal the fact that he enlisted in the army of a foreign power, thereby losing his citizenship. Thousands of US citizens enlisted in the Canadian and British forces, did any lose their citizenship as a result? As the uniform is obviously not American, concealing the badges and buttons would not prevent the obvious conclusion that he had served in the forces of the British Empire. Something else going on there I think. The extent to which the law was actually enforced is a separate question, but there is no doubt that foreign enlistment was illegal. Furthermore, he served as a noncommissioned officer, which further aggravated the offense. Separate only insofar as it might have affected the man's decision. The average American is unlikely to have even been aware of such a law I suspect. The obvious fact of having served remains proven even by the altered photo; thus the illogicality of suggesting the concealment of that fact as a reason for retouching the photos. Even if the uniform could not be identified, the fact of his not having attained such rank in U.S. service would make the foreign service undeniable.